All across our state, people are reading a book entitled The Mountains-To-Sea Trail Across North Carolina: Walking a Thousand Miles through Wildness, Culture and History, by Danny Bernstein. The author of this compelling book tells the story of how she discovered the incredible beauty and wonder of our state by walking our acclaimed state trail from mountains to sea. 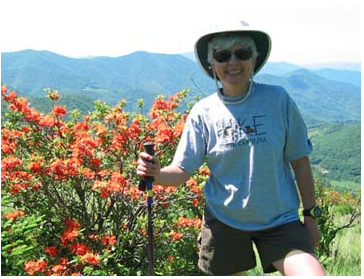 The Elkin Valley Trails Association (EVTA) has invited Danny to come to Elkin to talk about her experiences. And most importantly to discuss the chapter in her book: ” Elkin: A Trail Town?” Danny is excited about the potential of Elkin to become a major meeting place for hikers using the NC Mountains-to-Sea Trail and so are we. Will Elkin become a true Trail Town? That is our hope. Come and join us at the Elkin Public Library on Front Street at 7pm on Monday May 20th. Please help us spread the word by sharing this event on your Facebook pages and event calendars! ← Stone Mountain State Park – Vote it America’s Favorite Park!